Main Home With Five Bedrooms, Guest House, Pool, Dock On 5.5 Acres. For your family enjoyment, this riverfront retreat offers panoramic views and breathtaking sunsets over looking miles of the Elk River. ***Please no weddings/parties or other events*** Nestled on 5.5 areas on top of a 40 feet bluff above the water you will enjoy the water front lifestyle. From this vista, the river appears to be more like a lake with the sun kissing the water in the evening. The property has approximately 400 feet of waterfront, and 120 foot dock. The manicured estate starts as you pass through the large brick double gates down the illuminated graceful tree-lined driveway with circular access to both houses. You will enjoy the; outdoor park-like activity areas which include: sand volleyball court, tether ball, horse shoes, fire pit, barbecue areas, landscaped bridge, children’s play ground with swing set, picnic tables, scenic track for running or walking that meanders throughout the property, and professionally landscaped areas which complement the Chesapeake Bay’s setting and ambiance. This Estate home has; two full master suites, three additional spacious bedrooms, five full bathrooms, a professionally appointed gourmet kitchen, theater room, spacious marble covered living areas, a large mahogany library, glassed-in four season large room, two fireplaces and a complete reconditioned heated pool. More than a bonus room, the estate has a full separate guest home which offers; privacy from the main house, with 1 bedroom, 1 bath, kitchen, large living room with fireplace, laundry room and screened in porch. Sit by completely reconditioned in-ground pool and take in the amazing sunsets or take a soak in your spa/hot tub and enjoy the Eastern Shore lifestyle at this spectacular estate home. This riverfront retreat borders next to a state park and the Chesapeake & Delaware Canal and is a convenient drive to Wilmington DE, DC and NYC. We do not permit weddings or other parties or events to be hosted at the property. Occupancy is strictly limited to 15 people. We are both from the northeast and have always enjoyed our summers with the warm weather and outdoor activities. We love real estate and when we first visited this home we saw so much potential. We have carefully and methodically thought through every improvement and change we have made to the property. We really treasure our time at La Casa Del Rio - The River House. For years and years we searched for the perfect vacation home for our family. It seemed like everywhere we looked, our time was spent fighting traffic and navigating our way through the sea of other tourists. We actually 'stumbled upon' this amazing home and decided it would be perfect for us and so many other families. It is large enough to host multiple families and generations. Also, for the couple or even in-laws that want more privacy, the guest house is an incredible and spacious retreat. The views, the views, the views are amazing! You will simply melt with the sunsets. Five full bathrooms in the main home and one full bath in the guest house. 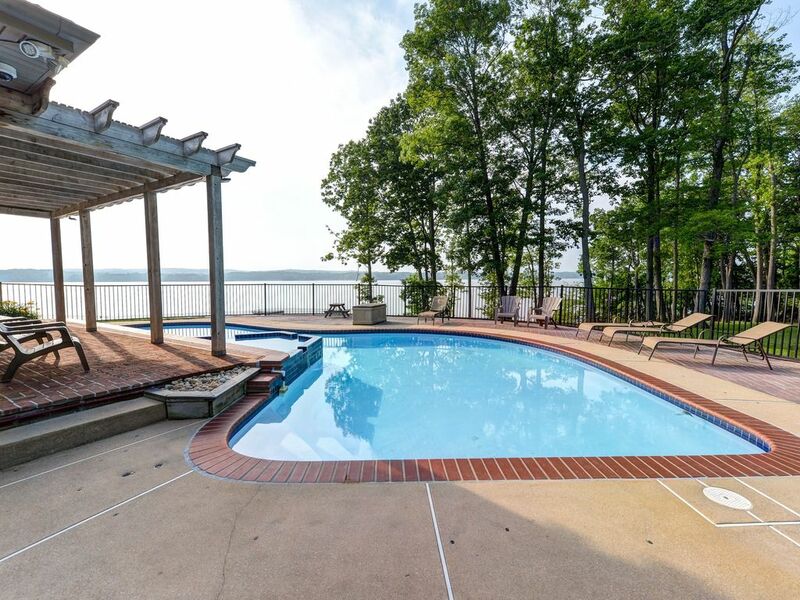 Spectacular views of the Elk River and over 450 feet of waterfront with pier. Living room with television, media room with oversized television, library with books, games and movies. Stayed here with a large group of friends the celebrate the new year. The house is beautiful, enormous and had everything we needed to enjoy the long weekend: movie room, grill, hot tub, fully-equipped kitchen, kid's outdoor play area, large dining room table and various sitting areas - there was plenty of space for everyone. The property seems like it would be even more perfect in the summer when you can enjoy the outside areas. Would definitely return for another vacation. Amazing experience beyond our expectations! When we first book this property, it seemed almost too good to be true. But everything was as perfecta as it seemed online! Our host is the most thoughtful and gracious we've ever had! We were provided with all the information needed for a perfect get-away weekend! The property is amazing, and contains everything one needs. The beds are very comfortable, bathroom are a dream, the terrace and other areas are in excellent conditions! Views are incredible! Our host went way beyond to make our long-weekend stay comfortable and memorable. Very tidy and lovely. Couldn't have been better! This place has become our family's vacation home! We had a great time and definitely will be back! Our group really enjoyed the house and location. Easy access but still private and house was well maintained while providing everything we needed for a long weekend. Will probably rent it again. FABULOUS! Great spot and great birds! We hosted a Board and Staff retreat there for our non-profit and it was super. There is a great hot tub and pool. The kitchen has RO water filtered with a HOT water good enough to make the tea drinkers happy. Plenty of refrigerators to keep the leftovers and pre cooked goodies safe and sound and the grounds were fabulous. Plenty of Towels for everyone. Great spot. We recently had a reunion here with young parents and kids ranging in age from 1-7 years. Incredibly spacious and a perfect layout with great amenities for kids (pool, playset, movie room) and adults (pool, firepit, basketball hoop, tetherball and volleyball court). We enjoyed more than one beautiful sunset dinner in the glassed-in patio. The kids have already asked about coming back and starting a new tradition! We had an amazing time during our weekend. The house was great and was well laid out with various areas for people to hang out together or separately.